Ok, I'm almost done catching up to my June travels! 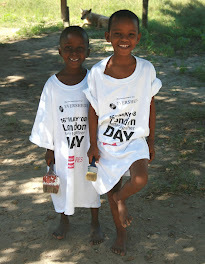 I promised myself I'd have them all posted to the blog before the end of July, and I'm coming in right under the wire. We flew from the Virgin Islands to D.C. to stay with my mom for a few days before coming back to Syracuse. 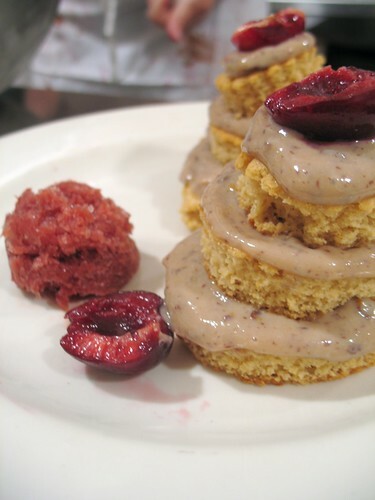 I took that opportunity to hop up to New York City for 1 day to take a class at the Natural Gourmet Institute. Inspired by Emilie's posts, I knew I couldn't pass up the opportunity to take a class with Fran Costigan. Here's the description- mouth-watering, right?? When I got to the class, I was so happy and relieved to see familiar faces. 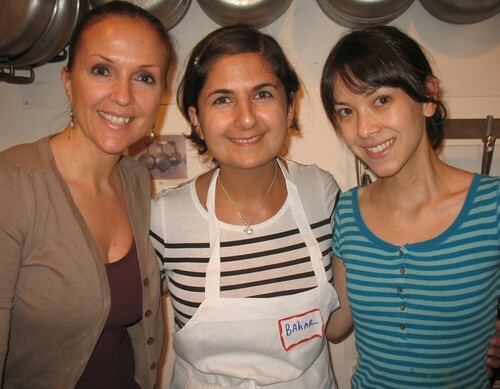 Danette (on the left), whom I'd met up with previously in NYC and who is an NGI veteran, and Summer (on the right), with whom I have some friends in common but had never met before. When I found out we would be in a team together, I knew this would be an awesome day. 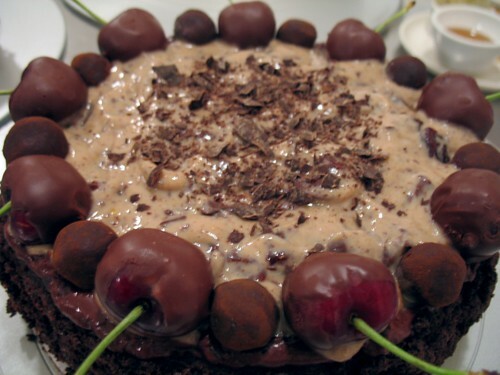 My group's assignment- a German black forest cake with cherry crème, chocolate-cherry ganache, topped with chocolate-covered cherries, truffles, and chocolate shavings. Here is a different presentation we made with the cherry crème, using a vanilla cake, poached cherries, and one of the huge hits of the day, the fresh cherry granita. So good! Here you see the delectable opera cake- hazelnut cake, espresso mousse, rich chocolate ganache, and gold-leaf dusted hazelnuts. 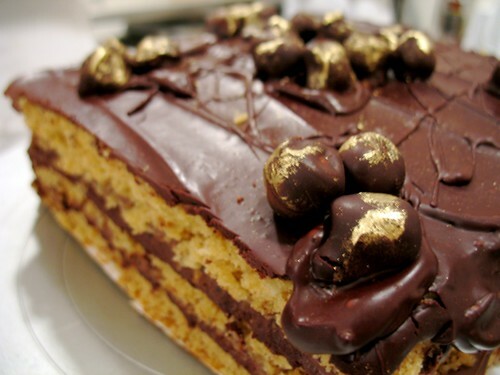 This cake was beyond decadent! Here is a refreshing presentation with mango mousse (extra intense mango flavor because of the use of dried mango), coconut sorbet, candied coconut, lime gelée, and mint syrup. Perfect summery flavors. 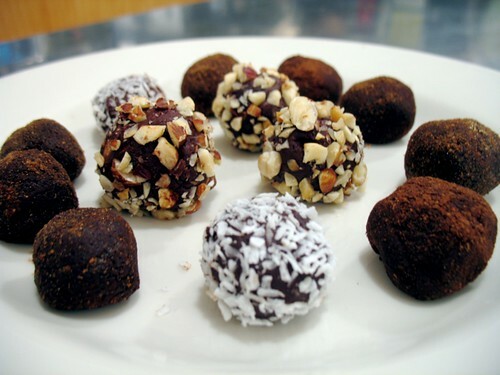 With the extra time we had, we used some leftover ganache to make truffles- here you see them in various flavors: coconut, hazelnut, cocoa, and clove-sugar. Yum. 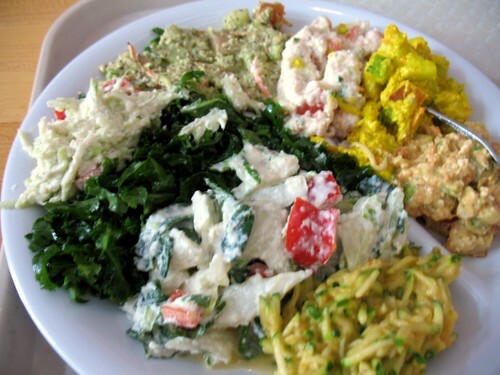 On our lunch break, my team walked over to Bonobo's, a raw foods restaurant that I had not tried before. I got the salad sampler platter that you see above- filled with steamed kale and 7 different salads, each of which was SO delicious. It was fantastic to give my palate a break from all the sugar of our class, and to energize my body for a few more hours of baking! At Bonobo's, I also got to sample durian for the first time (in pudding form)- and guess what? I liked it! 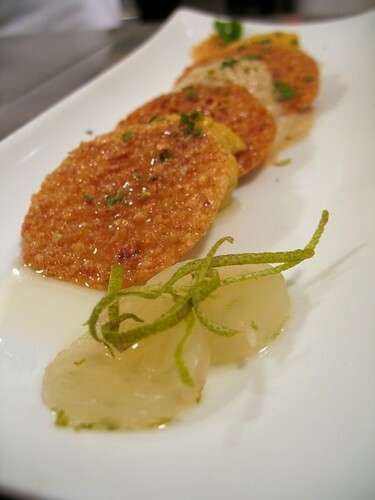 I learned a lot about techniques and ingredients from this class- I look forward to taking more classes at the NGI! If anyone ever gives you grief about the possibility of being vegan, healthy, ecologically/ethically aware, and decadent, please show them these photos! So there you have the last of my June adventures. After getting home at the beginning of July, Daiku and I have been playing a catch-up game- not just working and teaching, but also trying to rent our house and get packed and ready for our move to England, which is only (gulp!) 6 weeks away! That explains the infrequency of my blogging, but I hope to catch up and visit all your blogs over the course of this week! 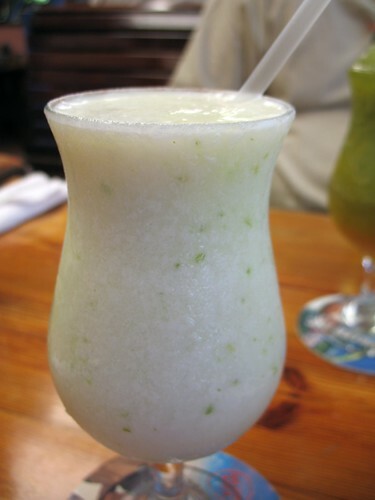 As promised, this post brings you some of my favorite drinks from St. John and the Virgin Islands, as well as a few bonus pics of all the cute creatures running around the islands! One of my favorite parts of the vacation was getting to come into such close contact with animals that I don't otherwise get to see every day. Ok, on to the drinks. If you want to party, Virgin Islands stuff, first start out with a nice bottle of dark rum, preferably Cruzan, which is made there (on St. Croix). You can probably google any of these recipes, but it is funner to improvise to make drinks that fit your taste. First you have the painkiller. 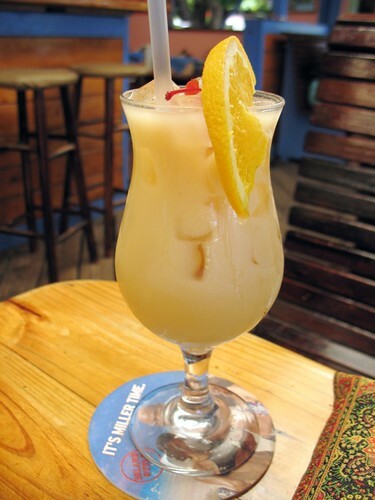 It is a delicious drink comprised of pineapple juice, orange juice, coconut cream, and rum. 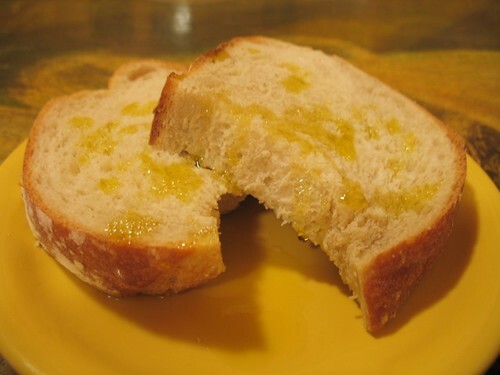 However, it is not complete without a generous sprinkle of freshly grated nutmeg on top. You can see Daiku grating nutmeg into a couple of painkillers in the photo above. Next, you've got the lime 'n coconut, a more acerbic twist on the beloved piña colada- coconut milk, rum, and the juice and zest of a lime. It is refreshing without being too sweet. 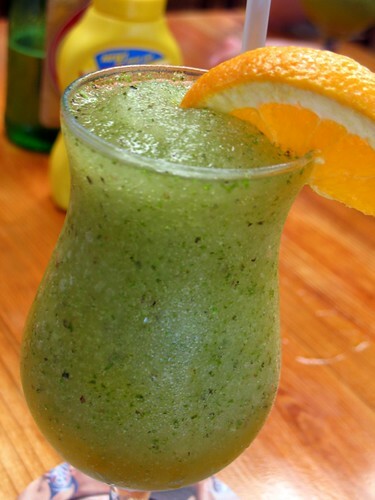 Next up, a passion fruit mojito- again, a twist on the classic. 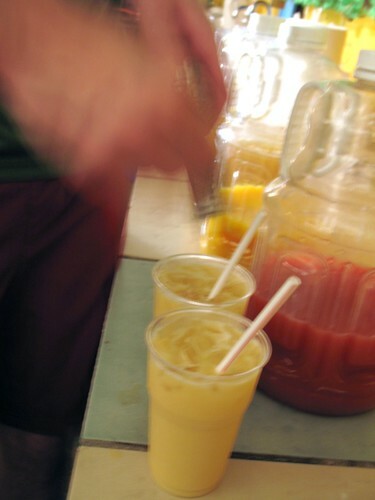 To your mojito (rum, sugar syrup, lime, and mint) add some fresh passion fruit pulp. Blend and serve chilled. 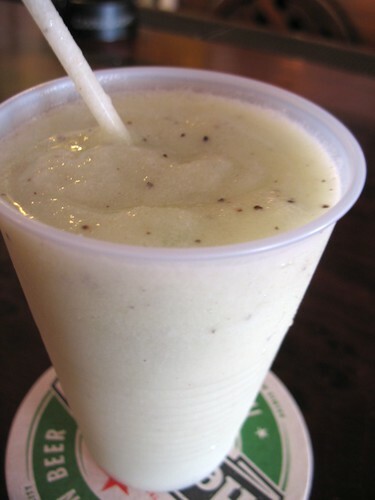 Another twist on the piña colada, perhaps my favorite: the kiwi colada. I watched the bartender add an entire kiwi to a the mix and voila- something that tastes more like a milkshake or smoothie than a cocktail- awesome! Of course, it wasn't all alcoholic beverages. 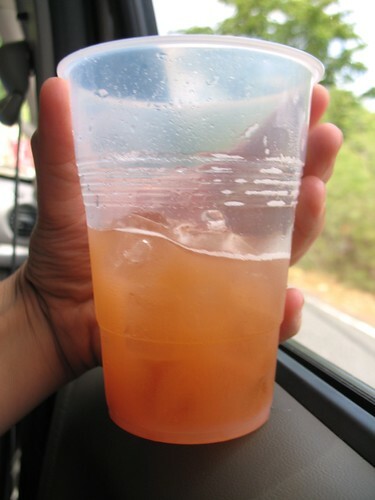 Here you see my guava drink from the Fire Foods Ital food stand. It wasn't just important for me to stay hydrated, but also to alleviate my motion sickness. St. John's roads are very bumpy (bad for motion sickness), and best navigated in sports-utility vehicles (even worse). Add to that boat and ferry rides, and you've got yourself one dizzy Bazu. Well, I managed to keep things calm by sucking on ginger candies, having a stash of saltine crackers on hand at all times, and most of all, drinking a LOT of ginger beer. Ginger beer is like a much more intense ginger ale- the combination of ginger and carbonation really help to settle my stomach, and I would recommend it to anyone with motion sickness. 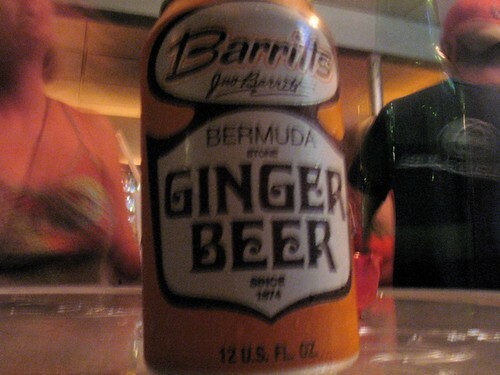 Ginger beer is also an essential component of that other famous drink, the dark and stormy. We made the mistake of giving this guy some crackers. 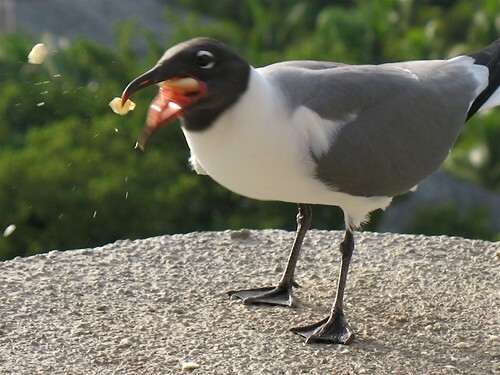 Well, he came back to our room every morning yelling and squawking and demanding to be fed. Which wasn't so bad because there were chickens and roosters running all around the island. And you know what that means, right? Every morning, the roosters crowed us awake at the crack of dawn. It was annoying for some people, but I loved it! By the way, lest anyone try and tell you that chicken are stupid or uncaring animals. I was walking along a back road in St. Thomas and came upon a rooster and a young chick. I gave them crackers. After cautiously grabbing a cracker from me, the rooster ran back and gave it to the chick! I was really touched by that. 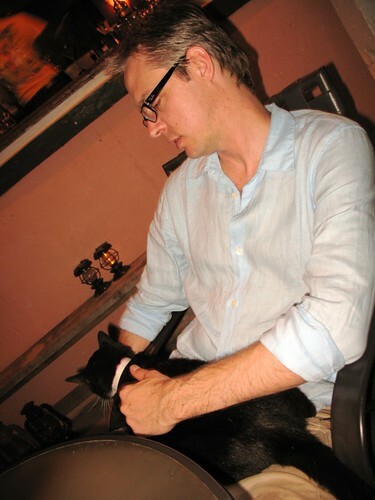 There are also a lot of cats running around on the island- this one jumped into Daiku's lap during dinner at a restaurant. 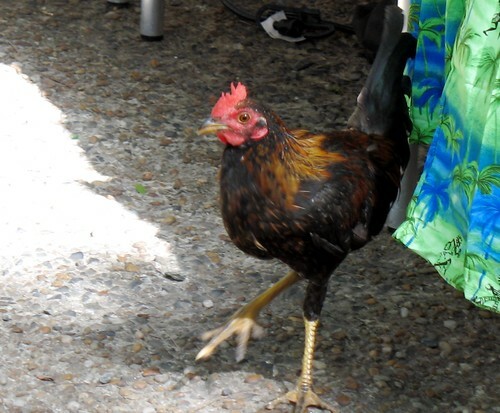 You would think the combination of chickens and roosters would be disastrous, right? Well think again. 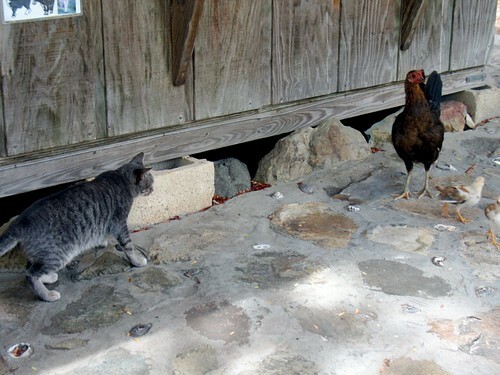 Here you see a chicken and her chick (on the right) scaring away a cat (left). The cat ran under the shack rather than face the mama chicken! 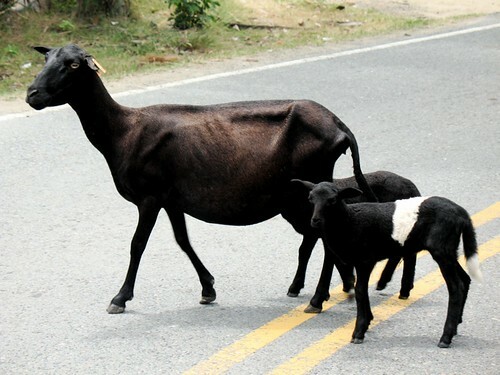 Speaking of mamas, here was a goat with her two kids, crossing the road leisurely. 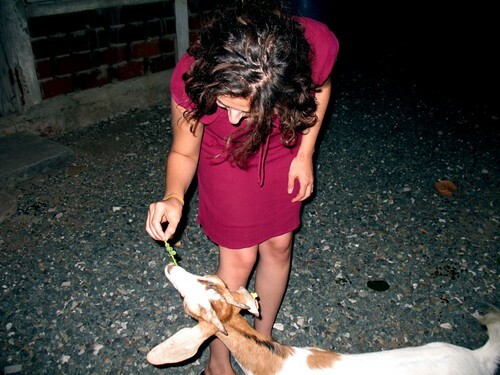 We saw goats everywhere. Even behind a restaurant. I had to get up and join the kids who were feeding the goats- they were too cute. 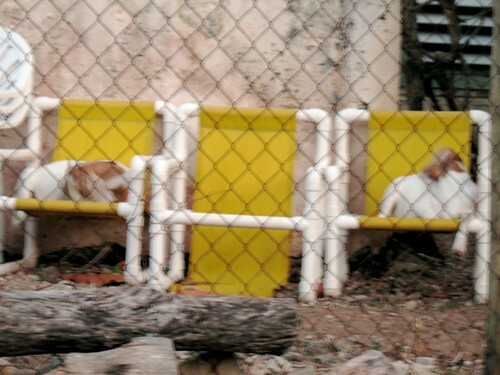 After they were done, they settled on chairs to go to sleep for the night- too much goat cuteness for me! and big. 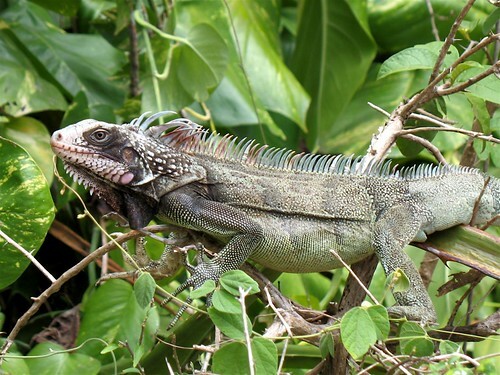 These beautiful iguanas were everywhere, and I couldn't stop staring at them. I hope you enjoyed these photos! 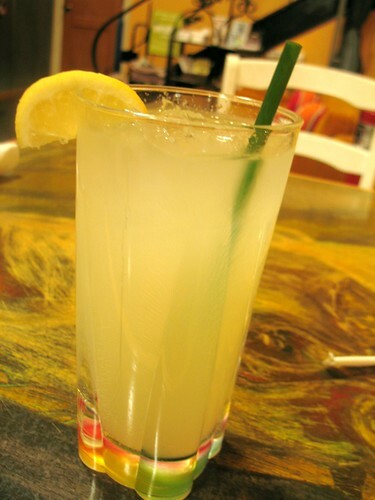 If you're somewhere warm, why not make yourself a nice rum cocktail today? 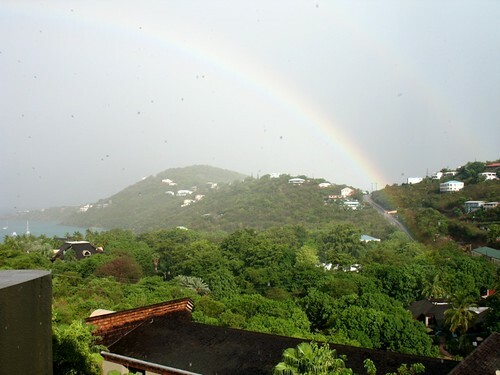 I've been trying to figure out how to blog about eating in the U.S. and British Virgin Islands, where I spent a week last month. 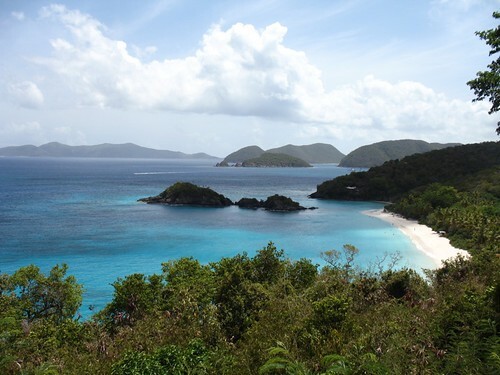 There's only one small problem- the Virgin Islands are really, really vegan-friendly! It's so easy to find good food that I have too many photos and stories on my hands. So after trying to find a way to fit all the culinary goodness into a post, I've decided to go with the simplest: just posting photos of the food, and linking to the restaurants where we find them. In my next post, I will show off some of the fabulous drinks that I tried while down there- and maybe throw in some photos of the cute animals from the islands! 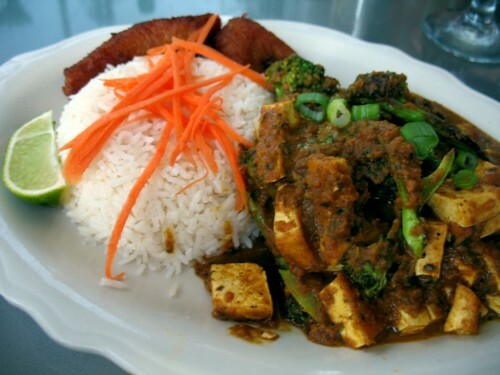 West Indian tofu curry at Sweet Plantains restaurant. 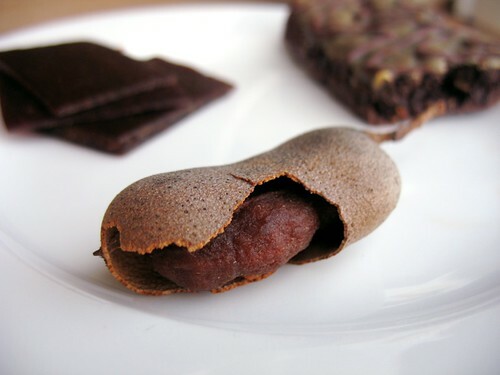 Breakfast tamarind from a tree! One of the many purveyors of Ital food on St. John. 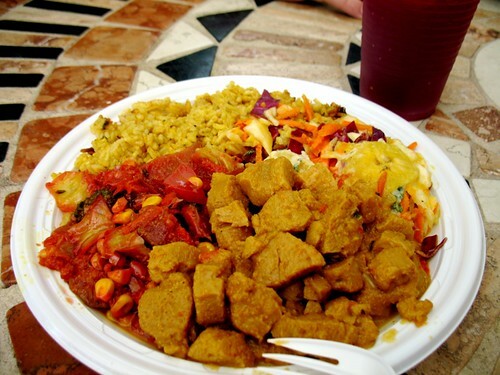 Ital is a huge help to vegetarians and vegans, since many Rastafarians follow vegetarian diets of varying degrees. Fresh gazpacho and house-made lentil burger at Shipwreck Landing. 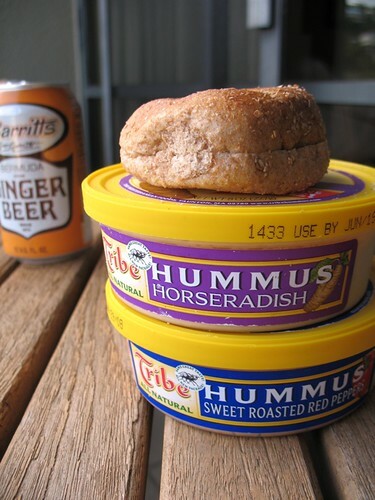 Some yummy groceries from the Starfish Market: different flavors of hummus, whole wheat bagels, ginger beer. 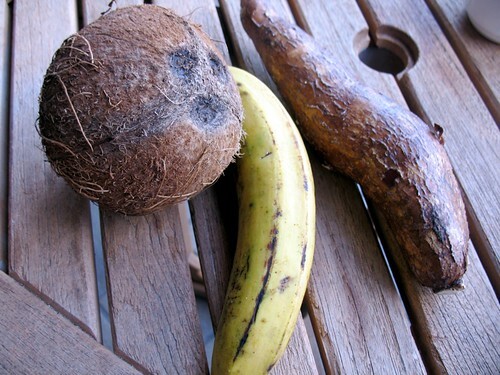 Produce from roadside stands: coconut, plantain, yucca. 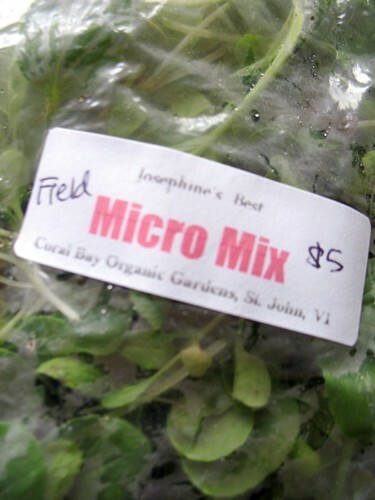 Organic micro-greens from Josephine's- she grows them right on the island! 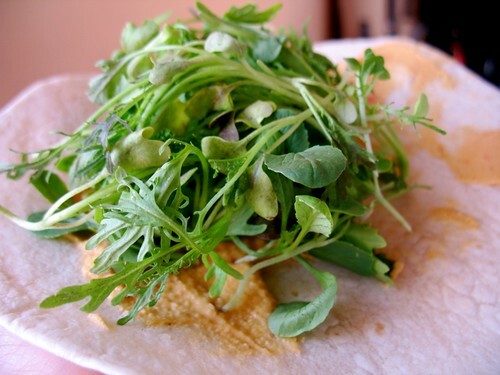 Spicy and delicious in hummus wraps. 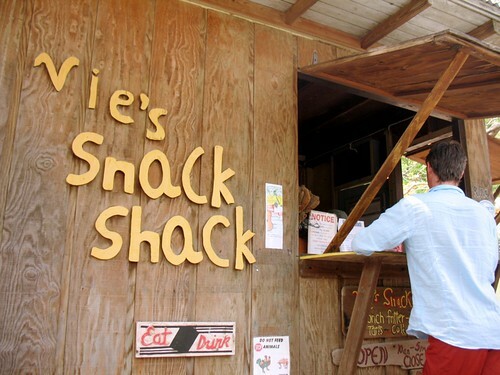 Red beans and rice, hold the sausage, at Vie's Snack Shack. Less fancy, but every bit as enjoyable (if not more!) 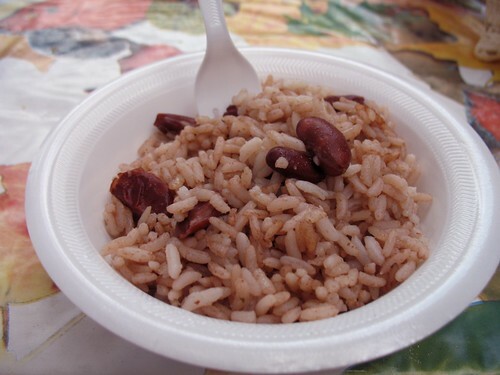 food from an Ital street vendor at the Cruz Bay market. 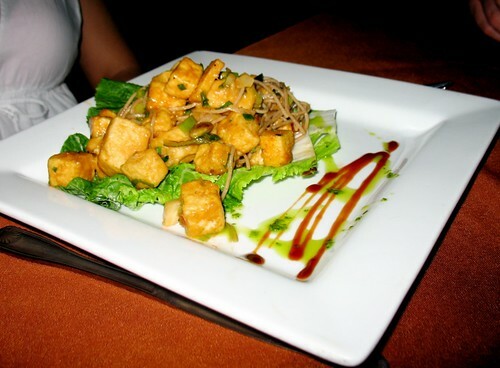 Tofu chunks, stewed veggies, plantains, coleslaw, and rice, with an energizing sorrel drink. I got excited every time I saw this stand at the market- he wasn't there every day, but I could eat his stuff all the time. 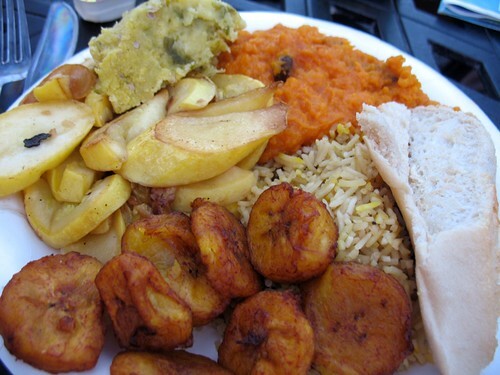 Platter of island goodness at Miss Lucy's full-moon party: rice, plantains, squash, sweet potatoes, corn pudding and bread. 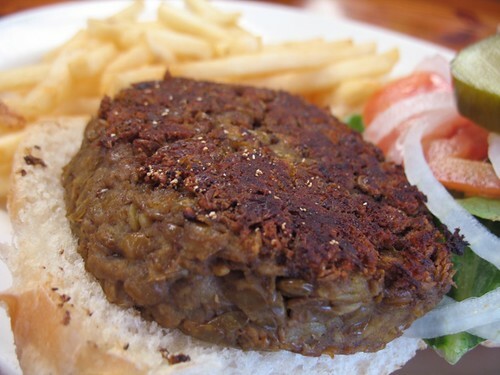 A tasty veggie burger at Sidney's Peace and Love bar and restaurant on the island of Jost van Dyke. 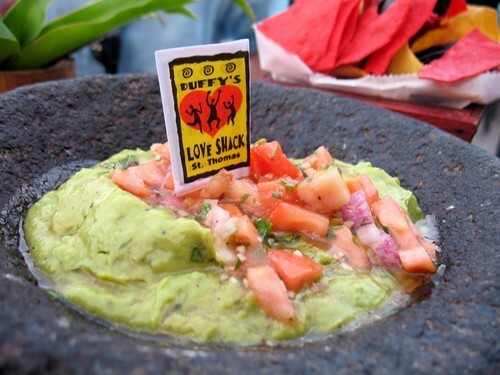 A humongous, meal-worthy serving of guacamole with fresh-made tortilla chips at Duffy's Love Shack in Red Hook, St. Thomas. 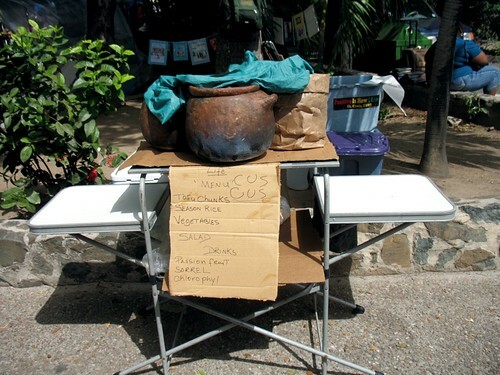 Just some of the signs of veggie-friendliness from all around the Virgin Islands. And, the obligatory Bazu eating fruit shot. 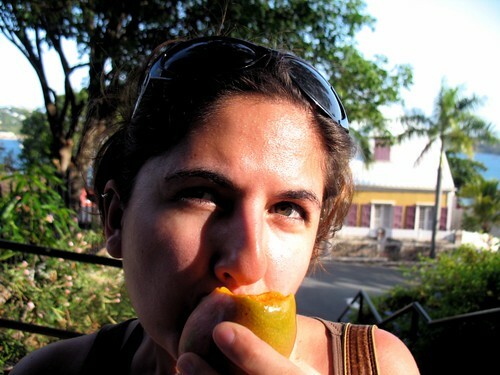 I found this mango on a ledge under a mango tree while walking around Charlotte Amelie in St. Thomas and couldn't resist. Sweetness, thy name is a mango tree. 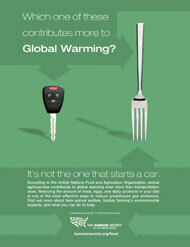 Conclusion: vegans and vegetarians will be hard-pressed to find a travel destination more suited to their needs. From fancy restaurants to street food vendors, dive bars to tourist attractions, supermarkets to road-side stands, you will never lack for a variety of fresh veg. 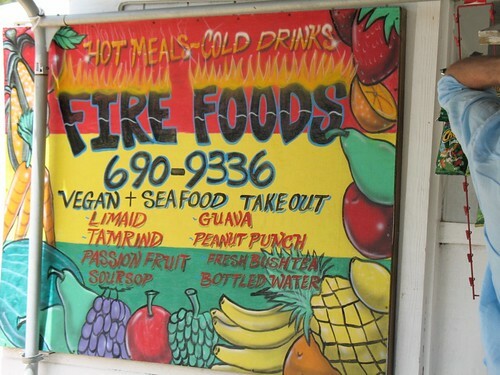 food in the USVI or BVI. As some of you know, I have been an AP art history reader for 3 years now. I greatly enjoy reading the ever-increasing numbers of exams, and having a chance to hang out with fellow art historians for a week. For the last two years, I have gone to New Jersey for this assignment. However this year, they moved us to Kansas City. As I hopped on the train for the 4-hour trip from St. Louis, I was excited to get a chance to visit a new city, and I eventually ended up much to love in a city known for its BBQ and steak. 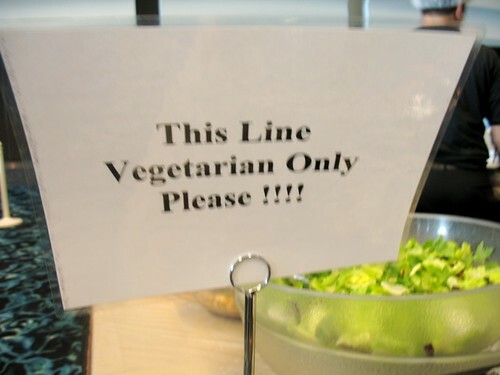 When I showed up, I found this sign in the vegetarian food line at the ballroom of the Kansas City convention center. 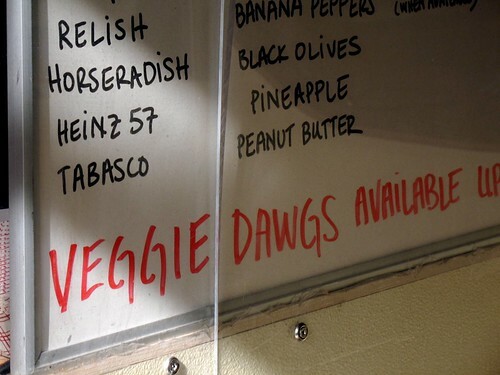 I was relieved that there was a dedicated section for veg. food- but I soon found out why the sign was there. 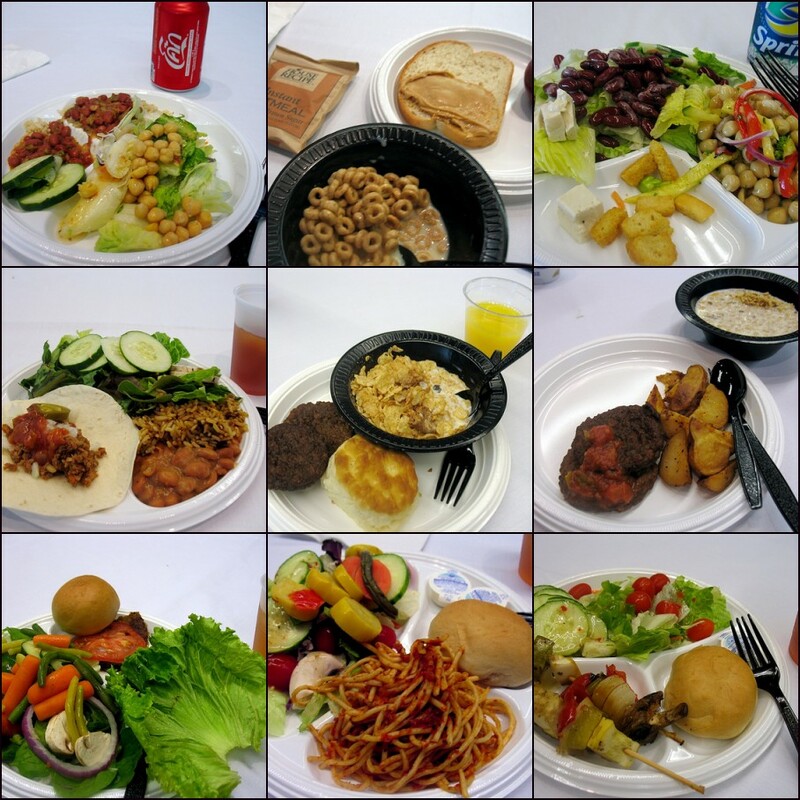 According to my colleagues, the food at the convention center was so bad that people were flocking to the vegetarian food, thus causing the food to run out before actual vegetarians had gotten their meals! How bad could the food be? Well, let's just say it was... institutional. 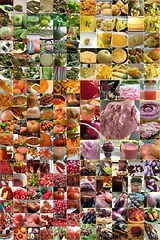 The above image is a collection of some of my breakfasts, lunches, and dinners. As you can see, it wasn't too difficult to eat vegan, and by the end of the week, there were even some pleasant surprises (tofu! tacos! beans!). 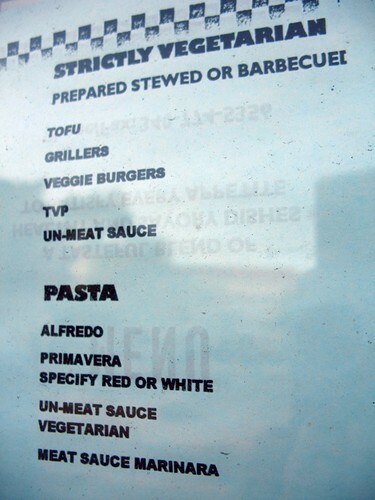 I also noticed some signs saying "brown rice available for vegans." Which, great, I love brown rice, but did I miss the memo that said that only vegans could eat it? 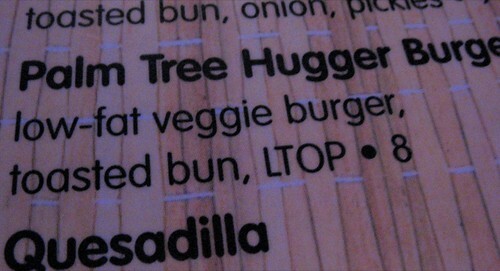 (You guys already know how I feel about needless food segregation and weird definitions of veganism.) 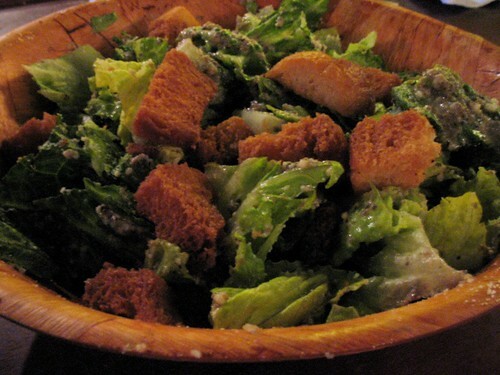 The food was honestly not that bad, but very bland and extremely repetitive. 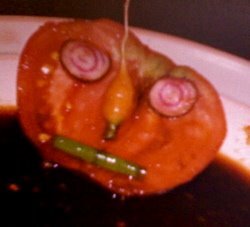 (Especially since I'd been spoiled for good fresh veg. 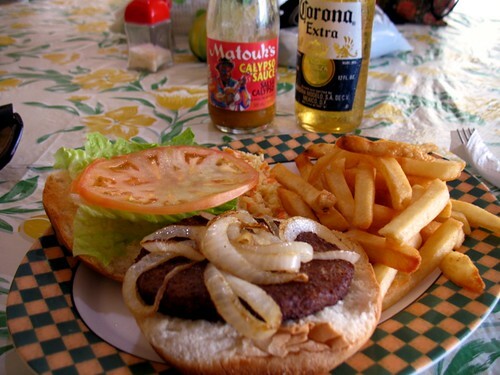 food in New Jersey, as you can see in this post from last year.) By the third day, the thought of veggie sausage for breakfast again was enough to make me ill. As you can see in the mosaic, by the end of the week (top photos) I had resorted to drinking soda with my meals just to settle my stomach, and I (like many other readers) started skipping dinner. 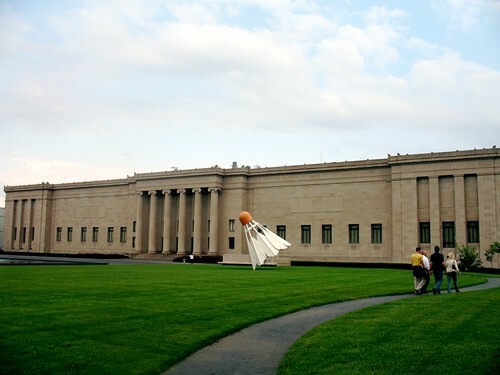 Here is a shot of the Nelson-Atkins Museum of Art, a giant and wonderful museum that I happily got to visit a couple of times while in K.C. 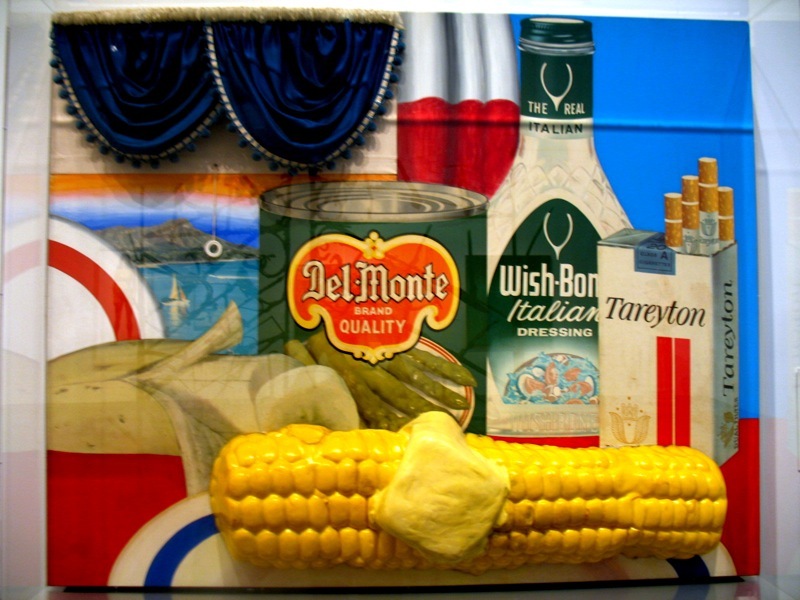 Here is a work of art by Tom Wesselmann that speaks to some of our worst fears about American food- packaged, processed, and bland. 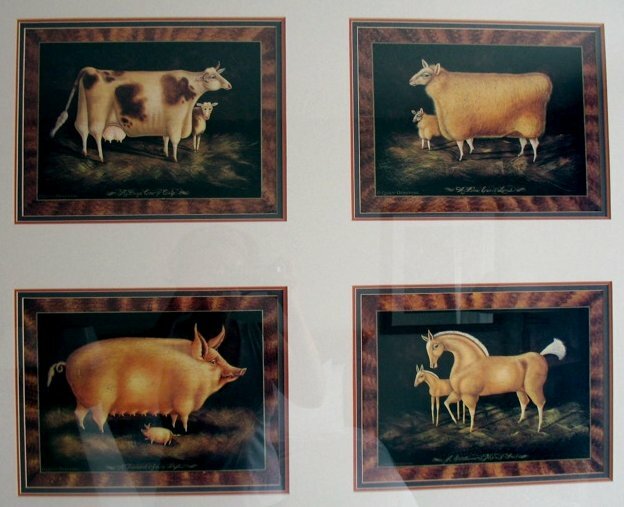 After a few days on my institutional diet, this piece really made me think. It's funny how distorted the promise of plenitude has become in the American psyche, isn't it? Fortunately, there was a whole other side to my visit. First of all, I was lucky to have found a wonderful yoga studio within walking distance of my hotel. At Kansas Siddhi Yoga, I got to work out the kinks in my neck and shoulders, but more importantly, work out the negative attitude that was starting to take over my mind. Taking advantage of the Kansas City Veg. 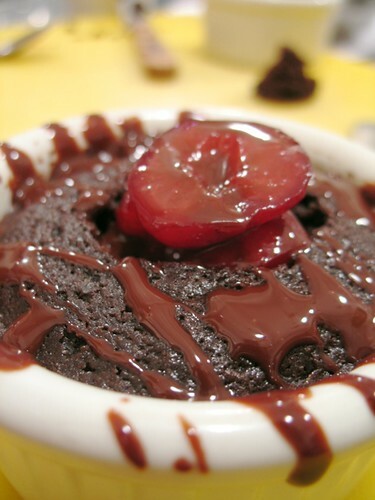 Restaurant Guide, the advice of fellow bloggers and PPK-ers, and the convenient and cheap K.C. public transportation system, I finally found enough time one evening to get myself to Eden Alley Café. When I saw the specials list, I knew exactly what I needed to get: watermelon gazpacho! 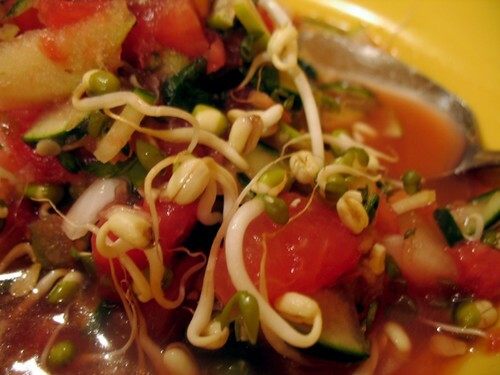 This raw dish, bursting with fresh ingredients (a gazpacho of watermelon, cucumbers, apples, and tomatoes, served with a big scoop of guacamole and topped with sprouts and lime juice) was the counterpart to the bland food I'd been having all week. 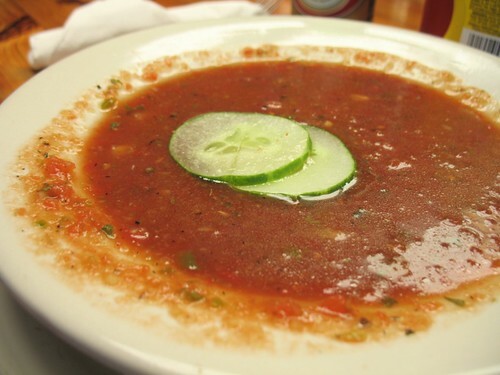 And gazpacho! I can't tell you how good this meal was. 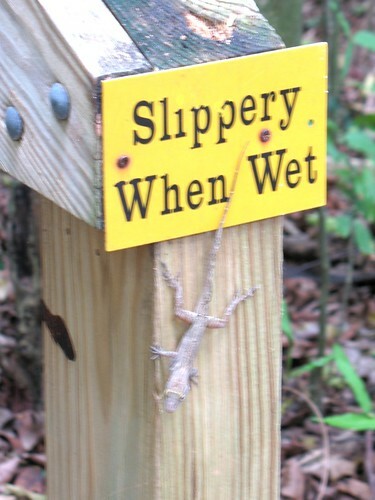 It was totally worth the trip, and getting caught in a thunderstorm on my way back! Especially because my awesome server slipped this chocolate lavender cookie to me after my meal, for free! 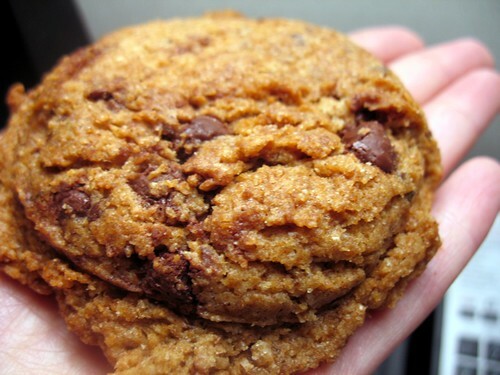 This cookie let me have something awesome and healthy to enjoy as everyone else snacked on candy bars during our reading the next day. There were so many other vegetarian and vegan-friendly restaurants that I still wanted to try in Kansas City, but I ran out of time. Good thing I'll be returning here for work every June for the foreseeable future. My yoga class allowed me to have gratitude- not only for the extraordinary vegan food at Eden Alley, but also for the quite ordinary food at the Convention Center. I was reminded that even though I complained about it, it was still food, vegan food. And that is something to be thankful for.